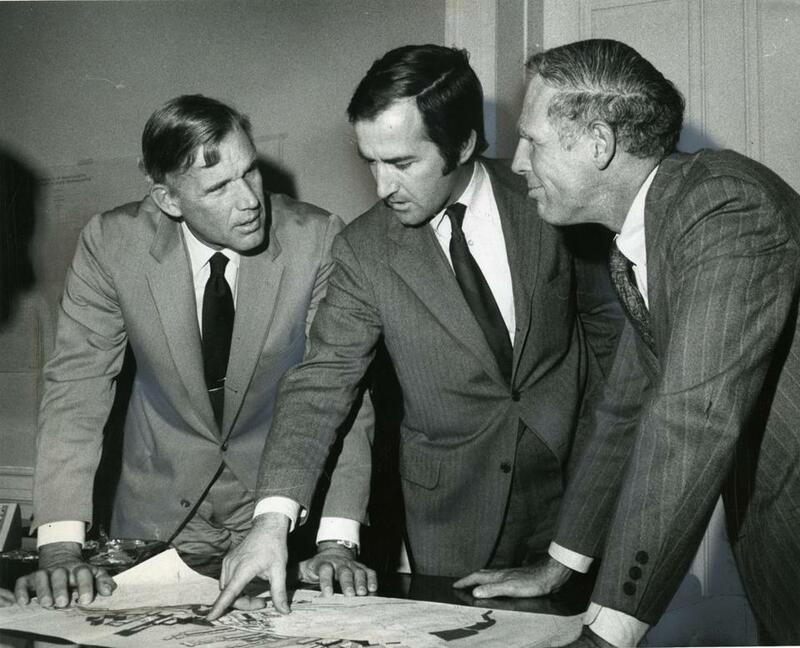 Boston Redevelopment Authority director Robert T. Kenney (center) discussed changes on Boston’s waterfront with Governor Francis Sargent and Mayor Kevin White. While awaiting confirmation in 1971 to become the third Boston Redevelopment Authority director to serve during Mayor Kevin White’s first term, Robert T. Kenney paused to contemplate a reporter’s question of why he agreed to take a job that two others had filled for such short tenures. Before that January day he had enjoyed considerable success running the city’s Public Facilities Department. On his watch several schools were built, along with libraries and police and fire stations. White wanted to give more responsibility to Mr. Kenney, whom he praised for his “imagination and his willingness to innovate.” But that would mean switching jobs in an election year. Mr. Kenney would take over the BRA when the looming ballot box made his work more political than usual. What was the appeal? “I guess it’s the challenge,” he told the Globe. Over his next nearly six years leading the BRA, Mr. Kenney helped change the look, feel, and character of Boston. One project in particular, the Faneuil Hall Marketplace, provided a much-needed spark for downtown development when it opened to great fanfare in 1976. Robert T. Kenney spoke during a hearing at Boston City Hall on the Park Plaza renewal project. Mr. Kenney, who went on to found and run Kenney Development Co., died of kidney ailments March 11 in the Clark House Nursing Center at Fox Hill Village in Westwood. He was 80 and had divided his time between Boston and Quechee, Vt.
“I just always loved the cut of his jib,” said Thomas P. O’Neill III, who was lieutenant governor of Massachusetts during the end of Mr. Kenney’s tenure as BRA chief. In building upon what his predecessors had begun, Mr. Kenney “modernized the city as not only the BRA director, but as an architect of the New Boston,” O’Neill said. With larger proposals, Mr. Kenney “had this unbelievable tenacity for tackling a very complicated project and getting his teeth in it and not letting go,” said his son Robert of Wellesley. And yet with a project such as the Faneuil Hall Marketplace, Mr. Kenney “spent most of his life deflecting all accolades back to the mayor,” his son added. Mr. Kenney afforded the mayor such courtesies even though they didn’t always agree. 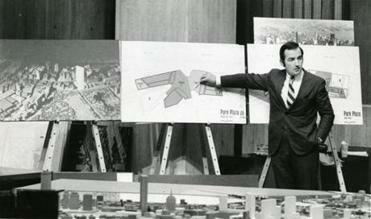 In 1974, White took the Park Plaza development project away from Mr. Kenney and gave the responsibilities to one of Mr. Kenney’s subordinates. With their respective development companies, Mr. Kenney and Walsh, who also is a BC High alumnus, converted the old school building into condominiums decades later. Mr. Kenney graduated from Boston College High School, from Boston College, and from Harvard Business School. He also served as a Navy supply officer, stationed on a destroyer. While at Boston College, he met Kathleen Whalen, whom he married in 1959. A service has been held for Mr. Kenney, who in addition to his wife and son leaves two other sons, Peter of Philadelphia and Christopher of Sherborn; a brother, Raymond of Woburn; a sister, Virginia Kennedy of Belmont; and nine grandchildren. Along with his development work, Mr. Kenney formerly chaired the Boston Harbor Association and the Boston-Kyoto Sister City Foundation, and he was on the boards of the Wang Center for the Performing Arts and the Massachusetts Convention Center Authority. Having lived in Wollaston and Boston for many years, Mr. Kenney liked spending time in an 1850 farmhouse he bought in Quechee, where “he fancied himself a gentleman farmer because one of the local farmers used to tap the maple trees on the property,” his son Robert said. Mr. Kenney repackaged the gallon of syrup the farmer gave him each year into individual portions he labeled “Bob’s Best” and handed them out at Christmas, each the perfect size for a single pancake.